My Daily Art Display today features Stanhope Alexander Forbes, an artist of the Newlyn School. The term “Newlyn School” refers to the artist colony located in and around the fishing village of Newlyn, in Cornwall, from the 1880s until the early 20th century, which specialized in landscape painting. Like the Continental artist colonies of the Barbizon School near Paris, and Pont-Aven in Brittany, artists gathered in Newlyn to paint landscape scenes in a purer setting, with strong natural light. Newlyn’s plein air painting followed the Impressionist doctrine of naturalism, which is a true-to-life style which involves the representation or depiction of nature with the least possible distortion or interpretation. The artists of the Newlyn School would work directly in nature, using subject matter drawn from rural working life, especially that of the fishermen. Newlyn provided the perfect setting for artists with the long hours of strong natural light, a climate which was much milder than the rest of the country and the seaside town was surrounded by coastal and inland areas of natural beauty. For the impoverished artist, Newlyn was, in those days, a cheap place to live and following new rail connections between Cornwall and London it proved very accessible. Forbes was born in Dublin in 1857. His father worked as a railway manager and his mother, Juliette, was French. His uncle, James Staats Forbes, was a noted art collector who also worked for the railways. The family often used to make trips to France and it was whilst on vacation there that young Stanhope developed an interest in art. The family moved from Ireland to London when his father was transferred and it was at this time that Stanhope attended Dulwich College and later became a student at the Royal Academy Schools where he staged his first exhibition in 1878. Two years later he and his friend and fellow artist he had met at Dulwich College, Henry La Thangue, went to Paris where they studied art under the French painter, Léon Bonnat. In 1881, having become familiar with the plein air paintings of the French naturalist painter Jules Bastien-Lepage, he decided to travel to Brittany, staying at Cancale where he painted A Street in Brittany. This painting met with great acclaim when it was exhibited at the Royal Academy in 1882 and the Walker Art Gallery, Liverpool, purchased it that same year. 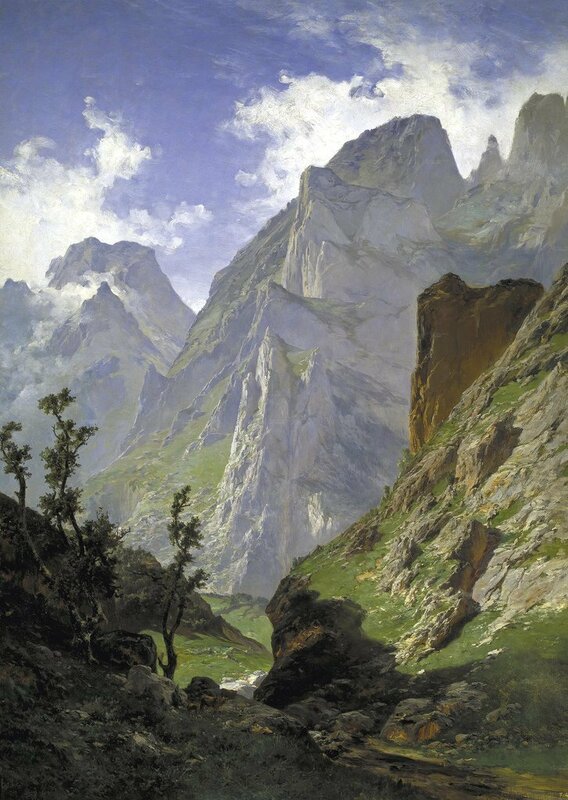 Forbes was greatly encouraged and he described the success of the painting as a turning point in his career. He once again returned to Brittany in 1883 staying this time at Quimperlé. He visited Pont-Aven in October and met many fellow artists there. Ten years later in 1899, as the number of artists in Newlyn dwindled, Stanhope and his wife Elizabeth founded their own Newlyn School of Painting. Her marriage to Stanhope Forbes was a partnership of equals, and their School of Painting was very much a joint enterprise. In 1910 he was elected to the Royal Academy. His wife Elizabeth died of cancer in 1912 and three years later in 1915 Stanhope Forbes remarried, this time to Maudie Palmer, a former pupil of the school and close friend of the family. Sadly, in August 1916, his son Alec died, killed fighting in the front line in France. Stanhope Forbes died in Newlyn in 1947, a few months short of his 90th birthday. In 2000, some fifty years after he died, his painting The Seine Boat which he completed in 1904, sold for £1.2 million and was a world record price for one of his works. 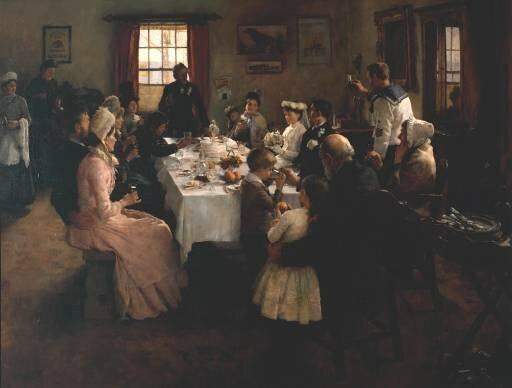 In his painting we have members of different generations of a family seated around a table in an inn for a wedding breakfast. Standing up, to the right, is a sailor, toasting the bride who avoids his gaze and the gazes of the other celebrants. She just shyly looks down at her bouquet. The painting is lit from different angles. Although this is not an open air scene which was the norm for the Newlyn School of Painters, Forbes has stuck closely to their modus operandi. The sitters are locals and not professional models and the setting for the scene is a recognisable place – in this case the local inn at Newlyn. The local fishing industry which played a big part in Newlyn life is not forgotten as in the picture, on the rear wall of the inn, we can see a painting of a ship and if we look through the window of the pub we can just make out the mast and rigging of a ship. The painting was bought by Sir Henry Tate for £600 and it became part of a collection which the philanthropist gave to the nation when the Tate Gallery was founded in 1897. The painting was well received and was highly praised when exhibited at the 1899 Royal Academy. It now hangs in the Tate Britain in London.